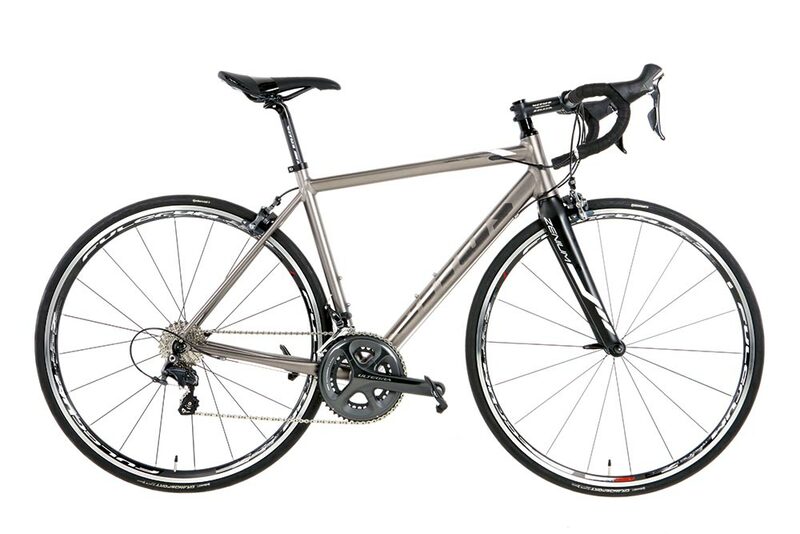 To find an entire Ultegra 6800 groupset on a bike under £1,300 is good news. We were intrigued to get hold of the Zenium SL PRO from Vitus Bikes, a company owned by online giant Chain Reaction Cycles, to see whether it offered more than just Shimano’s second-from-top drivetrain. Though it would be easy to say that the frameset on the Zenium SL PRO plays second fiddle to the groupset, that would be doing it something of a disservice. Vitus has utilised hydro-formed 6066-T6 aluminium to create a good-looking set of tubes for the Zenium, matched to a carbon-fibre fork. The frameset has little in the way of trickery — only the top tube accommodates an internally-routed rear brake cable, while the gear cables run along the underside of the down tube. 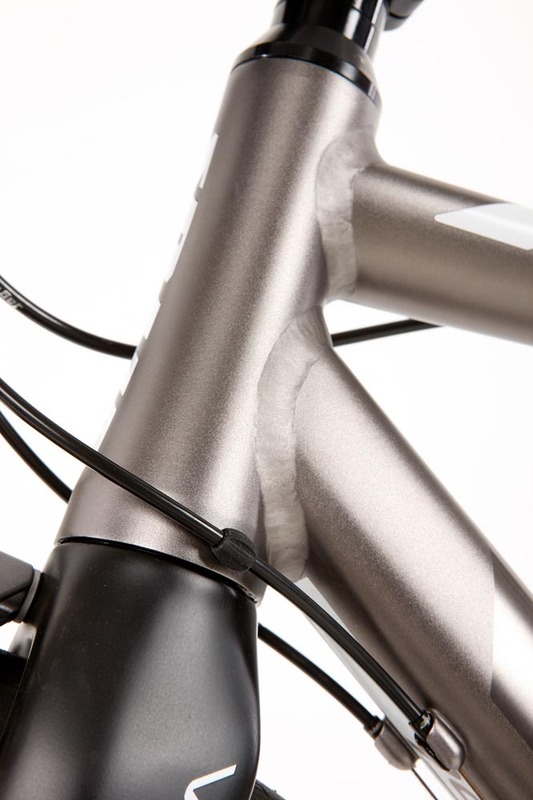 The frame has an all-over matt metallic finish that looks a lot like titanium. Frame graphics have been kept to an absolute minimum, and in a certain light you can’t see the subtle ‘Vitus’ name on the down tube as it is the same colour as the frame, just gloss instead of matt. It looks classy against some of the more lurid competition, but makes the frame, and therefore the whole bike, look rather plain. Shimano’s Ultegra 6800 11-speed groupset provides much of the componentry aboard the Zenium SL PRO, including both derailleurs, shift/brake lever, chainset and brakes. It is particularly good to see an Ultegra chainset, as this is often the first thing to get replaced with a lower-priced unit for the sake of penny-pinching. 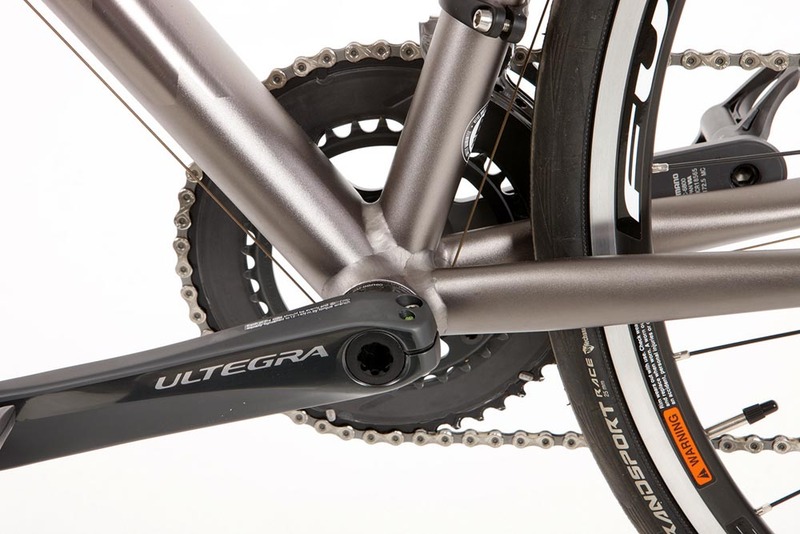 Vitus has only deviated in its Ultegra speccing with the use of a 105 cassette and KMC chain. Vitus has gone for a compact chainset offering 50/34 teeth matched to an 11-28t cassette. This gear selection has become something of a standard issue for bikes, and for good reason. It offers exactly the right spread of gears for 99 per cent of the population to tackle 99 per cent of the roads they are likely to encounter. Own-brand Vitus equipment completes the deal, with bars, stem, seatpost and saddle all finished in black. The bar tape is also black, but of a rather thin variety that accentuates the narrow diameter of the bars. The saddle is also worth singling out, with a sensibly plush amount of cushioning compared to some of the pretend racer’s planks that seem to be creeping into favour again. The Fulcrum Racing 7 wheels compare well with other wheelsets found on bikes at this price point. It’s noticeable that Fulcrum has employed an asymmetrical rim on the rear wheel, where the spokes enter the rim off-centre. This, Fulcrum says, allows better balancing of spoke tension. Vitus has gone for 25mm tyres rather than thinner 23mm, and has opted for the Grand Sport Race rubber from Continental. A good choice for the winter months. When you hit the road, it’s hard to look past the quality of the drivetrain. Happily, the Zenium’s Ultegra gears are as smooth as they come. In fact, the shifts are so quiet you can be forgiven for thinking the gear hasn’t changed — only a change in resistance when you pedal confirms that something has happened. It’s a truly great system, and one that carries on working well after plenty of use. The Ultegra brakes, too, are a confidence-inspiring presence. If you know you can bring the bike to a controlled halt, you can tackle downhills and twisting roads with assurance. The bike’s geometry helps this along with a neutral feel somewhere between ‘race’ and ‘sportive’, but one that manages to be comfortable. Adding to the comfort factor is the Vitus saddle and we appreciated the extra air volume in the tyres compared to our regular 23mm width rubber. When we first set eyes on the Zenium SL PRO, we couldn’t help wondering whether Vitus had pushed things too far: could an alloy frame really do justice to the groupset on a bike at this price? The answer is yes, it can. This is a well-balanced package that you could ride all year round and in all conditions, and feel comfortable doing so. There's even better news: since we originally wrote this article, the bike's price has been reduced to £1169.99.